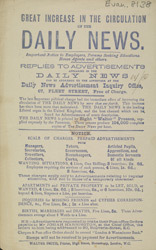 The 'Daily News' was established by Charles Dickens in 1834. He intended his paper to be a radical alternative to the most popular newspaper of the day, the 'Morning Chronicle'. Dickens used his position as editor of the 'News' to advocate changes in legislation - particularly in terms of civil liberties, education for girls and social reform. The novelist was not a success as an editor, however, and the fortunes of the 'Daily News' only picked up when John Foster took editorial control. A vastly experienced Fleet Street journalist with many contacts in high places, Foster commissioned early work by future luminaries such as HG Wells and George Bernard Shaw. In 1901, the paper was bought by Charles Cadbury, the head of the chocolate dynasty, who used it to protest against the war being fought against the Boers of South Africa.